Jason Mehmel is a comic book writer, but also an accomplished stage director and producer. His current show, King Kirby, is now running its Canadian premiere at Calgary's Sage Theatre, and runs until Saturday, April 23. The play was written by Crystal Skillman and Fred van Lente. Mehmel gives us the rundown on the show, the story of Marvel Comics legendary artist and creator Jack Kirby, his ups and downs in and outside the comic book industry, as well as his - what some call - very fractured relationship with better-well-known writer, Stan "The Man" Lee. Also, on April 19 there will be a Talk Back Tuesday session, where the audience can listen to some of Calgary's top talent in the comic book industry discuss what it's like to be an artist/creator today, compared to being an artist in Kirby's day. And those creators are: Fiona Staples, Riley Rossmo, Ryan Ferrier, Nick Johnson, Tyler Jenkins and Ben Rankel. Whether you're a creator or media, those in the comic book industry really do support one another, and with a play like King Kirby, I was more than happy to present some questions on behalf of our friends, We Talk Podcasts. 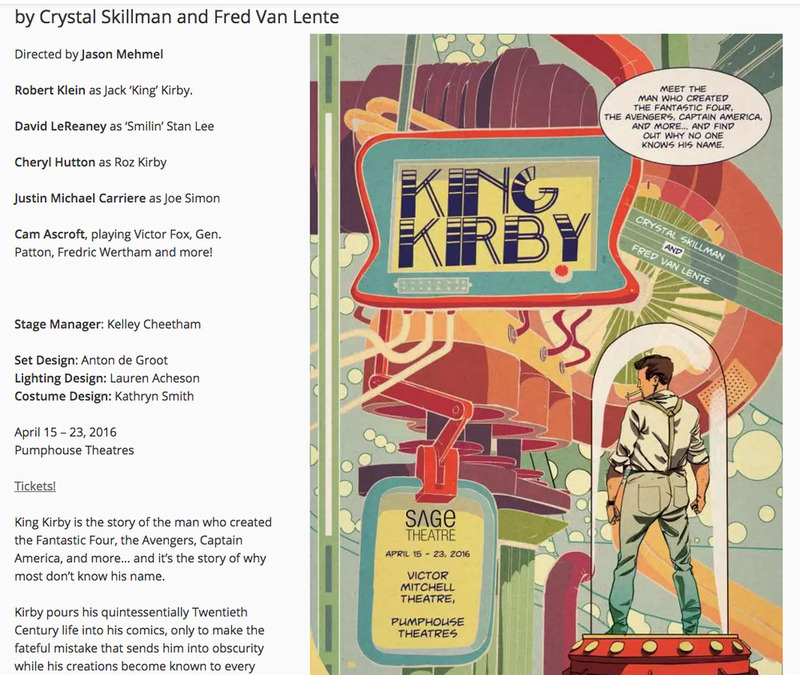 And I've now rambled on long enough, so please go ahead and hit play and listen to Mehmel tell you even more about this already well-reviewed play, King Kirby.